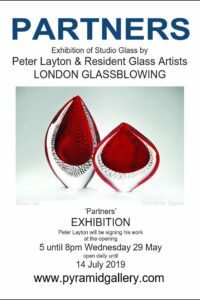 Peter Layton has been represented by Pyramid Gallery continuously since that time and at 82 he is now regarded as the doyen of studio glass blowing in the UK, having celebrated 40 years running London Glassblowing and having helped some 40 or so glass makers establish themselves as artists in their own right. Keen to work with galleries all over the UK, London Glassblowing refer to their favoured gallery outlets as Partner Gallery’s. 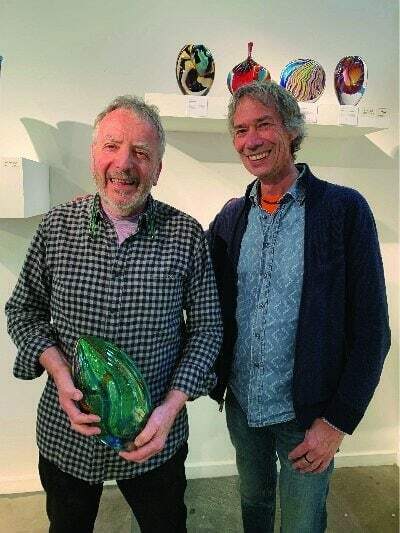 To Terry, it seemed very appropriate that for his celebration of 25 years as a Partner to London Glassblowing, Peter and his team of 10 glass makers should cooperate in an exhibition to be known as ‘Partners’. Peter Layton will be exhibiting some 30 pieces of glass from several ranges alongside some very special pieces by his team, who are Jochen Ott, Cathryn Shilling, Laura McKinley, Layne Rowe, Louis Thompson, Bruce Marks, Elliott Walker, Tim Rawlinson, Hanne Enemark and Anthony Scala. In October 2018, Peter and Ann Layton took part in a tour in Borneo with orangutan vet, Nigel Hicks and his wife Sara Fell. Nigel and Sara, having devoted ten years of their practice to saving orangutan, started a charity called OVAID, whose mission is to raise awareness of the plight of these critically endangered apes, and to provide essential medical equipment for a number of orangutan rescue centres in Indonesia and Sumatra. Taking part in the very rewarding trip, allowed Ann and Peter to contribute to this incredibly worthwhile work. In December 2018, London Glassblowing adopted Gito, an orphan orangutan rescued in an appalling condition in 2015 by International Animal Rescue. As an integral part of the vet team OVAID spent many weeks giving him one to one care including physiotherapy, and gently caring for his skin condition. With much compassion and dedication, Gito’s physical and mental health improved dramatically and he attended Baby School where he was able to explore the forest with his new friends. He has now become strong and determined and will one day return permanently to the wild. Peter has developed a new series, Gito, named after the little orphan orangutan. London Glassblowing will donate 20% of all proceeds from this series to OVAID on a continuing basis. Born in Prague and brought up in England, Peter Layton studied ceramics at the Central School of Art and Design in London under some of the foremost potters of the day. He chanced upon glassblowing while teaching ceramics at the University of Iowa and since returning to Britain has been continuously at the forefront in promoting this magical and versatile medium. In 1969 Sam Herman conceived and set up the Glasshouse in Covent Garden. Peter Layton helped build the first furnace there and was involved in its beginnings. He subsequently established his own small glass studio at his pottery at Morar in the Highlands of Scotland, a Glass Department at Hornsey College of Art (Middlesex University) and in 1976, the London Glassblowing Workshop in an old towage works on the Thames at Rotherhithe. 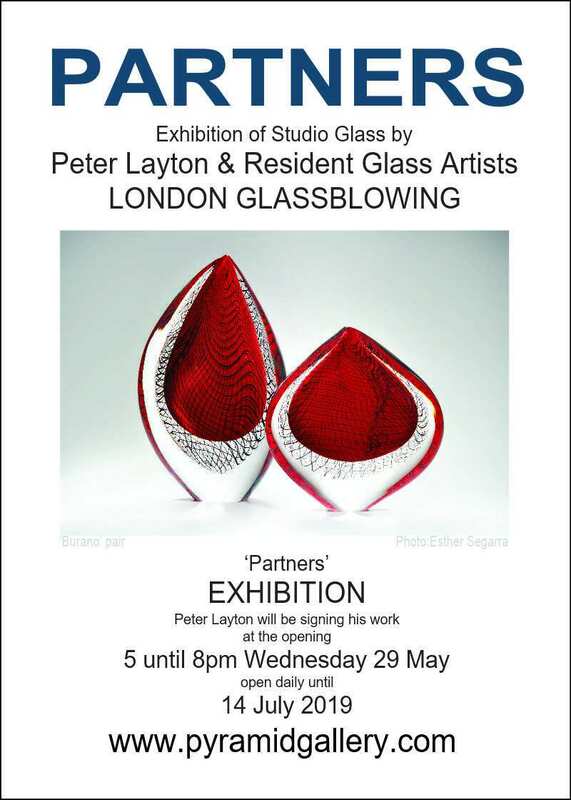 Peter Layton produces individual pieces of decorative glass in sculptural and functional forms. The work is free blown, permitting a greater degree of involvement and attention to detail than is possible on standardised production and ensuring the individuality of each piece. In 2016 London Glassblowing celebrated 40 years in business and Peter Layton celebrated his 80th birthday. In amongst the various celebration Peter managed to fit in a visit to York to open a show at Pyramid Gallery and to give a talk about his art in glass to the York Artworkers Association.